I love going going out to the garden or farmer's market and coming back with a basket full of fresh summer vegetables for dinner. On a hot summer day, there's nothing like a cool bowl of soup. It's like a savory version of ice cream. Especially this soup, since it's mostly chicken stock and creme fraiche (sour cream). What could be more creamy and soothing? Oh, but there's more. We also added avocado. I love the combination of creamy avocado with crisp cucumber. Throw in some fresh mint and it makes the most refreshing and soothing bowl of soup. I could have added water instead of chicken stock to dilute this soup. But why would I want to do that? Chicken stock adds a lot of flavor, but even more importantly, it adds nutrition. Chicken stock also helps to heal and seal the gut lining, helps build strong bones and teeth, and the collagen will give you beautiful skin. If you are dairy-intolerant, you can use kefired coconut milk. Just take 1/2 cup of coconut milk, add kefir grains, and let it sit overnight in a mason jar. 1. Peel and coarsely chop cucumber and avocado. Peel the garlic cloves. Set aside. 2. Add to a blender or food processor: 2/3 of the chopped cucumber and 2/3 of the chopped avocado (set the rest aside), the white part of the scallions, garlic cloves, the mint leaves (not the stems) and the chicken stock. Blend on medium or high until pureed. 3. Season to taste with sea salt and freshly ground black pepper. 4. Transfer soup to a storage container or bowl, cover and stick in the fridge to chill (if you're in a hurry, you can also just add ice cubes). 5. Put equal parts of cucumber and avocado in soup bowls. Pour the cold soup over the vegetables and serve. I wrote this post while participating in the Sowing Millions Project by Real Food Media on behalf of Seeds of Change. I received product and exclusive content to facilitate my post. My thoughts and opinions are my own and not of those of Real Food Media or Seeds of Change. Oh this sounds so yummy. Maybe I will sub ghee for the sour cream since we’re not to dairy products yet. I added it to the ingredients list too just in case people don’t see that. Yes you did but I am scared of kefir and have no grains right now. I WILL divide and conquer. I think I was most worried about ruining my VERY expensive raw milk so coconut milk is a GREAT solution for experimentation. Does it come out tasting sweet or just like sour cream? Even though I have now drunk cool chicken broth, the thought of cold soup still doesn’t do it for me. This one sounds tasty, but i might want to want it warm. I think you guys will be surprised at how good it is cold. If you like gazpacho, you will love this! cold soup doesn’t appeal to me either..but who knows… i’ve done lots of NEW stuff. oh- cold soup is awesome! Gotta give it a try. My favorite is a cold strawberry soup…….sooo yummy! Oh I love cold strawberry soup! i do have all these ingredients, ‘cept the mint… ’bout how many leaves is that? Looks Yummy Ann Marie! Thanks….think I might try this one today! Ate it with some anchovies, and aged cheddar on the side. Yummy combination! This soup sounds delicious. When I make some more chicken stock this recipe will be at the top of the list to try. Just in time to take for lunch when work starts up in less than 2 weeks. Just found this recipe on my fish mongers site. Not used to eating cold soup, but this sure looks good as well. hours or chill completely overnight. Mix all ingredients except for yogurt and paprika together well in a bowl and chill well. crabmeat/shrimp mixture and sprinkle with paprika. Yum!! I’m so glad you are sharing cold soups for this hot weather! This sounds amazing! Once again you’ve encouraged me to think of flavors I haven’t experimented with yet. I’m really not boring ;) just re-learning and expanding after my food conversion! Mmmm. I’ve been looking for more good cold soup recipes to enjoy during this heatwave. Thanks for sharing! Advice anyone? I am allergic to chicken and turkey, so do you think as a substitute it would be better to use fish broth or beef broth? I also will be using coconut cream instead of the dairy cow cream cause of allergies. I believe you can substitute with fish and beef broth. Try it out, and see if it works for you. Also, I would recommend the GAPS diet to get a hold of those allergies if you are not already on it. Thanks Erica, I have been on the GAPS diet intro since May 20th. I’m experiencing some healing, but it has only been two months, so I have a long way to go. How long have you been on it? I’ve been on it for nearly 2 months. I was typically on it before, but had included some tubers, as well. I went through the Intro very quickly, lasting about 5 days until I was craving cheese, lol. I’m able to tolerate a lot of foods. However, I’m on this diet just to be sure that my gut is really healthy. Dr. Natasha Campbell-McBride even mentioned in a podcast that it may be necessary to go back to the intro if you are under a lot of stress even if you are not on the GAPS diet. She stated that she sometimes goes through Intro for a few days when her life gets a little too stressful or when sickness occurs. Yes, I do remember hearing about Dr. NCM talking about going back to basics after sickness or stress. It is a good idea. Bone broth settles my stomach down so much. Wow, that is cool that you are able to tolerate lots of foods. It sounds like you gut will be very healthy eating so much broth and probiotics. I was eating lots of sauerkraut and water kefir before gaps with no headway, so that is why I went on GAPS. Finally, I am going the other direction which is cool. Are you the Erica that lives in the bottom of the world? Where do you live? Chile? That’s a nice video, Sewpretty13! Where was this taken? I don’t eat too much broth. I usually just consume 2-3 or maybe 4 cups a day of it. It’s not good to consume too much broth unless you are really sick. I haven’t did the probiotics yet either. I was consuming some fermented foods with each meal. I will try the probiotics soon as I know that they are very potent at recolonizing the gut with beneficial flora. To be honest, eating plenty of animal fats in accordinace with the organ meats, bone broths, fermented foods, and the meats surrounding the bones are what really is doing me good. I recommend that you drink no more than 5 cups of bone broth daily unless your body feels it is necessary or a qualified doctor suggested you to do so. Just listen to your body, and see what it wants. Ann Marie had a blog post of her husband starting out with the GAPS diet. She stated that Dr. Thomas Cowan advised her husband to consume 4 cups or a quart of bone broth a day for the intro of GAPS. Notice that he did not say to go all out with the bone broth. Dr. Natasha Campbell-McBride even stated that she desires GAPS patients to consume more meat stews, as the meats and connective tissues surrounding the bones are very healing to the body. I believe the bones provide the minerals, and the connective tissues surrounding the bones provide the gelatin. Both of them together work very powerfully, which is why I believe Dr. Natasha Campbell-McBride emphasizes meat stews so much. Woops, bones do contain collagen. However, I’m not forsure how much they contain compared to connective tissue. Can someone explain this for me? That delicious healthy food doesn’t have to cost a fortune the only thing one needs is a little bit of know-how, and the courage to try things out. Thank you for this recipe. so glad you posted this recipe because we are swamped with cucumbers of all sizes in our garden. 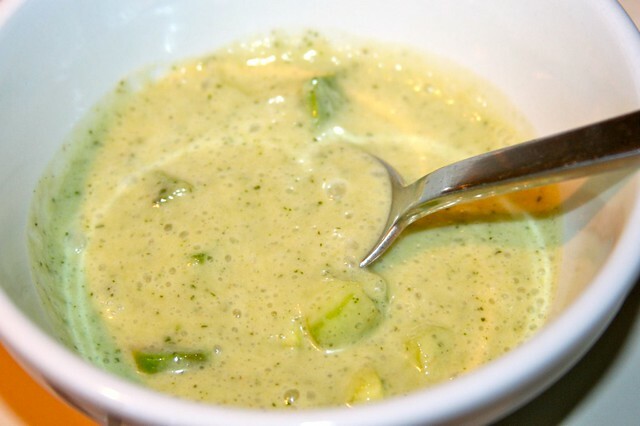 we made this soup tonight with some armenian cucumbers and it was excellent! thanks! WHAT do you do with the sour cream? It is not included anywhere in the directions.